Self-Absorbed Boomer: The American Victory floating museum in Tampa. The American Victory floating museum in Tampa. 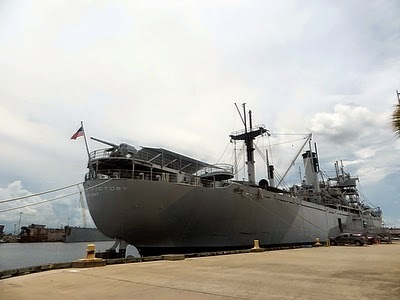 American Victory is one of three surviving examples of the "victory" class of cargo ships built near the end of World War Two to serve in the Allied war effort. They succeeded the liberty ships, of which 2,710 were built in the early war years; certainly the greatest feat of ship mass production in history. While the liberties were, as FDR called them, "ugly ducklings," the victories were, in my opinion, among the handsomest of twentieth century freighters. I've known two men who served on American Victory. One was Paul Schiffman, whom I knew over the course of many years when he served as afternoon and early evening bartender at the Lion's Head. Paul was a mate on her maiden voyage in 1945, when American Victory was used to ship cargo to American forces in the Pacific. The other is Mike Wholey, whom I met at a memorial gathering for Paul, and who served as a mate on her final voyage in cargo service, delivering supplies to American forces in Vietnam in 1969. After that final voyage in 1969, American Victory was mothballed and put into the reserve fleet. She was kept at anchor in Virginia's James River. 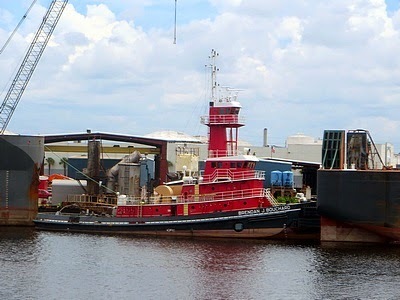 In the late 1990s she was due to go for scrap, but in 1999 she was acquired by a private company, The Victory Ship, Inc., and brought to Tampa. 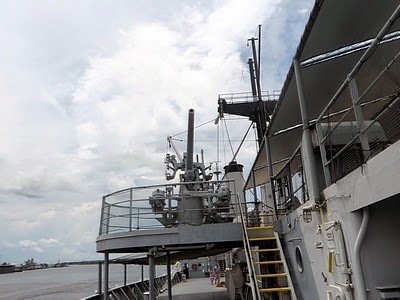 She is docked there, at a former commercial dock adjacent to the Florida Aquarium, where she serves as the American Victory Mariners Memorial and Museum Ship. 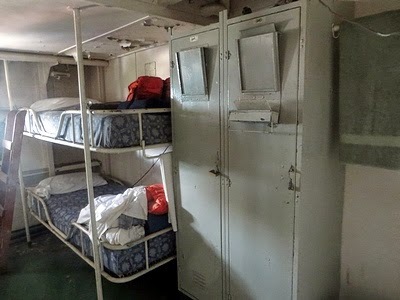 She has been maintained in seaworthy condition, and makes occasional short cruises. 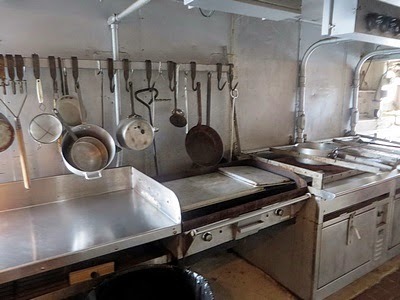 She is listed in the National Register of Historic Places. 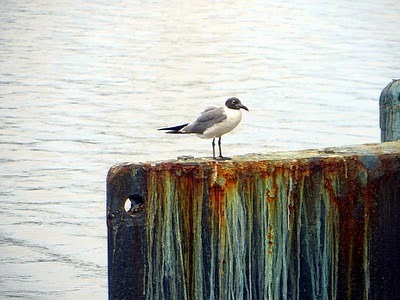 As I approached her from the stern, I saw a laughing gull perched on her rudder. View of the ship's bridge and funnel from the main deck. 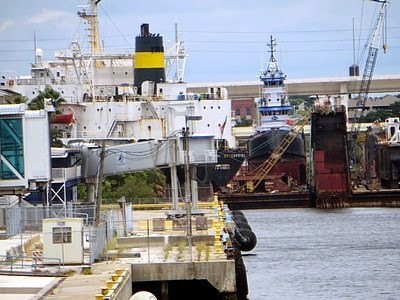 Seen from the main deck, the tug Brendan J. Bouchard and a barge were docked across the channel. One of American Victory's antiaircraft guns, seen from near the stern, looking forward. The ship's bridge. 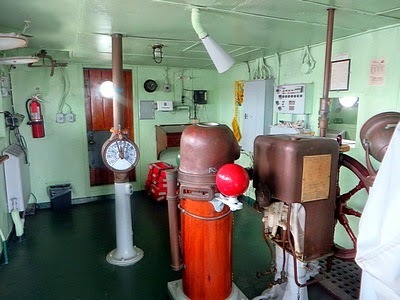 Note the wheel at right, the compass and radar screen housings, and the engine room telegraph with the dial face, used to send instructions to the ship's engineers below. 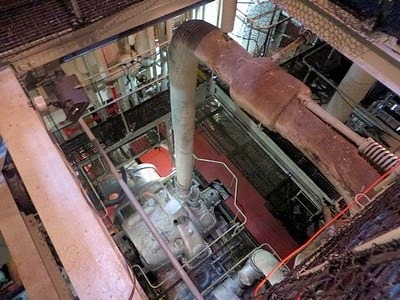 Looking down to the engine room, from a catwalk. 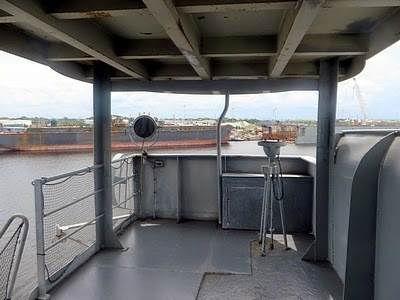 Looking aft from American Victory's stern, a cargo ship is docked further up the channel. 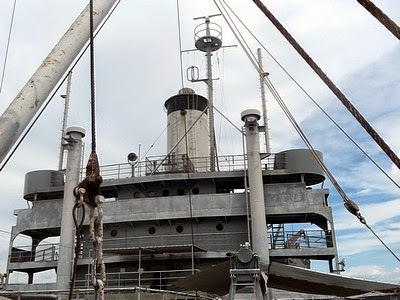 Beyond, the tug Sea Eagle is in drydock. American Victory is one of several victory ships that were named for American colleges and universities. She is named for American University, in Washington, D.C., in recognition of that institution's contributions to the war effort. Jo Stafford, "Autumn in New York."